I like going to the Orange Tree theatre and I like seeing my friend Jonathan Tafler acting. 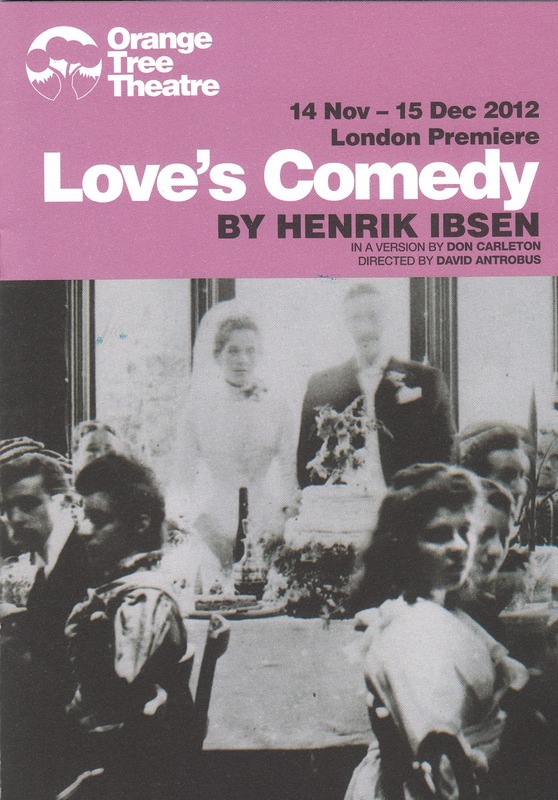 I have seen my sister in a number of Ibsen plays, but Ibsen's not on my list of heroes - not because he doesn't deserve to be, of course he does, but because I've never got into him. So Orange Tree & Jonathan and seeing my sister and niece, all well and good. But Ibsen? A very early Ibsen? Never before performed in this country? Why not, one wondered. Presumably because it wasn't up to much. So: I had reservations. So, although the words were fundamentally of the student-play variety, they were richer than the usual fodder (hardly a sentence was allowed to pass without a metaphor or simile tanking it up), and the cast was thoroughly up for them, even the rhyming couplets that they quite often took to being. The set had an apple tree blossoming and bits of garden furniture, and a van-goghy sky, plus there was a twittering (traditional sense) bird. I wasn't bored for a minute. Sarah Winter as Swanhild (the lead female) was excellent though her voice occasionally grated, and Mark Arends (male lead) was thoroughly inflamed as revolutionary poet / lover, etc. Mr Tafler, as always, was terrific.